Consisting of five weekends, this is an apprenticeship into a living lineage of Peruvian Shamanism. Part I is open to all those wishing to deepen their connection to Spirit and the animate universe, with no prior experience necessary. Parts II-V, build upon the teachings and initiations received in the prior weekends, which are prerequisite. This apprenticeship series, called The Pachakuti Mesa Tradition: Cross-Cultural Shamanic Arts for Personal and Planetary Renewal involves hands-on practice and initiation. The PMT is a profound yet practical, user friendly, living shamanic tradition dedicated to both personal and planetary healing. Through this apprenticeship, one's own innate healing and spiritual potential is awakened. The apprenticeship revolves around the creation of a mesa, a shamanically empowered altar, unique to you, yet following the traditional, ancient Andean template. 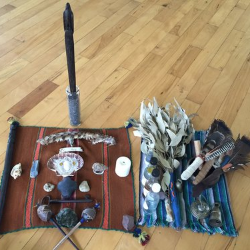 The mesa provides a living, vibrational technology of the sacred from which you may draw upon, and apply a vast array of shamanic healing modalities and capacities that come down to you from over at least three millennia. Apprenticeship hours for each weekend: Friday, 7:00 p.m. - 10 p.m. ---- Saturday, 9:30 a.m. - 9:00 p.m. ---- Sunday, 9:30 a.m. - 3:00 p.m.